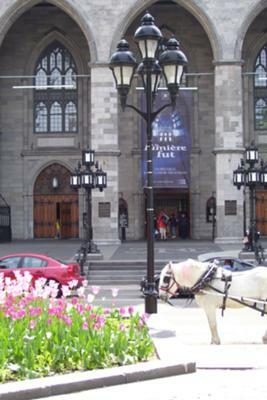 This doesn't show much of Notre Dame Basilica, but I love the horse and the flowers. If you look closely, you'll see that the horse has a patch of mane dyed the same shade of pink as the tulips! Join in and write your own page! It's easy to do. How? Simply click here to return to Vacation Photos. 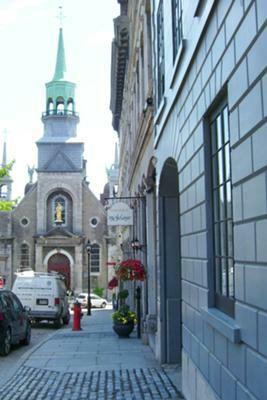 Vieux Montreal (Old Montreal) is the oldest part of the city, with narrow cobblestone streets and beautiful old buildings. I thought this street, with the small church at the bottom of the hill, was charming. Old Quebec is situated along the St. Lawrence river, and many of the old buildings are renovated warehouses (this was a shipping port two hundred years ago). Because of the harsh winter winds along the river, the warehouses were built without windows on the side facing the river. 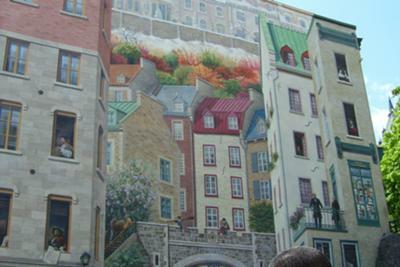 These buildings often have trompe l'oeil paintings on the blank side to add interest; this one depicts the four seasons of Quebec (the winter snow is on the top), along with many Quebequois historical figures. This looks like a street scene with several buildings, but it is really just a flat wall! 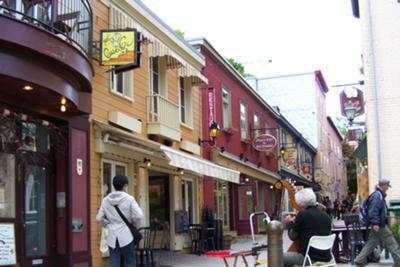 Old Quebec is very old, with buildings dating back to the 1700's. This street scene shows colorful shops (this is an artist's district, with plenty of one-of-a-kind objects) and a street musician.